Key skills: ecosystem monitoring and modelling, research and information synthesis, data analysis, technical review, and workshop facilitation. Marc’s work focuses on understanding and managing ecological processes in freshwater, marine and terrestrial ecosystems. He brings a wide breadth of experience gained through work on a multitude of projects throughout Canada and the US Pacific Northwest as both an analyst and a project manager. Marc is a Registered Professional Biologist (RPBio) and Senior Systems Ecologist at ESSA with over 25 years of experience. In addition to his strong background as an ecologist Marc is particularly skilled in the use of geographic information systems (GIS) for integrating biological and physical information. His projects at ESSA involve both analysis and technical facilitation. 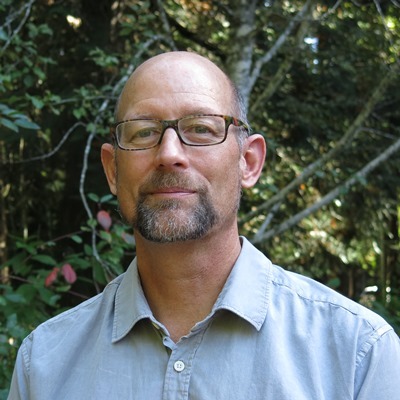 Marc has served as facilitator for a number of ambitious multi-agency undertakings seeking to develop comprehensive adaptive management strategies to address vulnerabilities of endangered fish and wildlife populations in western Canada, the US Columbia River Basin, and northern California. As an analyst he has a broad range of experience having undertaken (for example) 3rd party reviews of project-level environmental assessments (mines, pipelines, port facilities), contributed to evaluations of the detectable effects of large scale watershed restoration projects on the productivity of U.S. Chinook salmon populations, piloted development of GIS models for predicting habitat use by BC’s freshwater fish species, and developed multi-season, multi-species instream flow needs (IFN) models for protecting salmonids in tributaries throughout the Canadian Okanagan Basin. Marc also currently assists with development of improved bird monitoring on the Missouri River in support of the Missouri River Science and Adaptive Management Plan. Marc also has considerable skills in literature review and synthesis, with such projects including: scoping of the feasibility, impacts and benefits of restoring anadromous salmon stocks to Canadian reaches of the upper Columbia River; development of lake, stream and estuary indicators for tracking trends in the status of BC’s salmon habitats; assessment of the potential role of hydrosystem projects on delayed mortality of Columbia River salmon; and Cohen Commission evaluations of the role of historical freshwater habitat impacts on recent declines of BC sockeye salmon. He has also been involved in the framing of a number of multi-scaled monitoring programs for assessing potential cumulative effects of land development actions on fish and wildlife, including BC’s Forest & Range Evaluation Program’s Watershed Status Evaluation Protocol, the Pacific Salmon Foundation’s (PSF) assessment of salmon Conservation Units in Northwestern BC, and the BC Ministry of Environment’s Environmental Values and Components Manual for defining the indicators and thresholds of concern to be used for tracking status of BC fish and wildlife populations. Before joining ESSA, Marc’s work experience included analyses of large-scale inventory datasets of both fish populations and their habitat, and he was involved in a suite of field-based fisheries and wildlife research focused on the effects of BC logging practices. Additionally, Marc has undertaken fish and wildlife surveys throughout BC, Ontario, Alberta and the Yukon. Marc holds a B.Sc. in Wildlife Biology and a M.Sc. in Zoology, both from the University of Guelph. His thesis work focused on the community ecology of waterfowl species in northern Ontario wetlands. Marc’s appreciation of the natural world also extends beyond his working life and he spends many hours hiking, camping, canoeing and scuba diving with his wife, kids and dog (well, not for scuba). Beyond that he spends as much of his time outdoors as he can and is a keen triathlon competitor and participant in individual running, cycling, and open water swimming events.